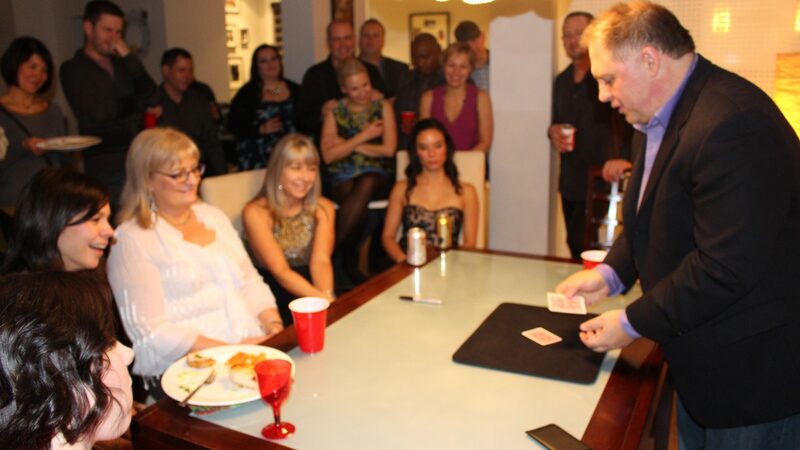 Winnipeg Magician Loren Findlay - Make your next event a success! Do you like Magic? Contact us to book your next event! We hired Loren to provide entertainment during a reception at our annual conference. Loren’s magic was unbelievable. Our guests could not stop talking about what a great experience they had with him and how much fun he added to the reception. Loren was professional and very easy to work with. We can highly recommend him to entertain with his magic at your event. My Sister and I saw Loren at our staff Holiday Party. We were both impressed at how he incorporated the audience into almost every thing he did. We both loved the card magic and were wowed by the whole show. I have watched Loren perform several times. He is funny, clever, entertaining and very magical! You will be amazed! I had the pleasure of watching Loren’s magic at my office Christmas party. Great showmanship, with some pretty amazing magic. He kept everyone entertained and captivated. Loren performed at our workplace holiday party. I couldn’t stop smiling and laughing-his act is a delight! Having grown up in a family where summer evenings were all spent at the cottage playing card games, being surrounded by people laughing and having it good times together, it was natural that when it came to magic, playing cards were a strong focus for me. I have such fond memories of those times we would gather to play cards games. It might be just two people and a crib board. Or it was 12 of us with 12 decks of cards playing some strange version of canasta. No matter who was it was....family, a friend that dropped in for the weekend, or even some one from a neighboring cottage, the card games became the central place for laughter, good times and bringing everyone together. Going back 35 years, when the family gets together its those memories that at the forefront. Remember that time when Grandma tried cheating? Remember that game that got interrupted because of the bear? Memories that stay with us forever, that we associate with the time or the place where they happened. This was the background I grew up. That lead to my dreams of being able to perform magic for people that would create those same memories of laughter, good times and so much fun. This is what I can do at your event. A group of people gathered around, laughing, then being left speechless by the mysteries created in front of them, in their own hands, as I provide the magical entertainment for your event. Based in Winnipeg Manitoba, I will come to your event and provide you with entertainment that is guaranteed to wow your guests and leave them with amazing memories. When ever you host an event, you picture your guests arriving, greeting each other with hugs and smiles, maybe grabbing a bite to eat and wandering the room with a drink in their hand and having the time of their life. But how do you make sure this is what happens? How do you make your event the talk of the town? When I perform at your party, I create an atmosphere where people are smiling, laughing, talking to each other about what they have experienced. I create memories that people talk about much later. I help you create a night that people will remember, talk about, and that will bring a smile to their face that they will always associate with you. I can guarantee that I can help create this kind of event for you. Whether its at your wedding while you are off getting pictures done, and having a magician to entertain people during cocktails while they wait for your triumphant arrival, or being the ice breaker during the wine and cheese event at your conference or doing a show in your living room while everyone gathers around. These are all examples of what I can do for you. The benefit of this is it gives you the freedom to make sure the other aspects are being attended to. Do the chips need refilling? Are people talking to each other? Oh No!! Is the food burning? You can look after the details while being assured that your guests are having a great time. Contact me and we can talk about the specifics of your event and what I can do to guarantee that its a memorable night. I primarily work in and around Winnipeg Manitoba.